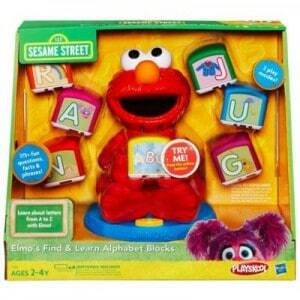 Elmo's Find and Learn Alphabet Blocks makes learning about letters and the alphabet so much fun! Your child can place a block in Elmo's hand and watch as he comes to life – he'll be so excited to tell them about his favorite letters which are all on the blocks. Push a button to switch to question mode and discover another great way to play and learn about the alphabet! Elmo will ask your little one to find a particular block by communicating phonics and different picture hints. Elmo's excitement for getting it right will thrill your child, and his encouragement and hints will encourage your child to keep trying! Elmo's Find and Learn Alphabet Blocks can be found on Amazon.com for $26.49, at Target.com and at Walmart.com for $29.96.